Harry Ashton was born in 18962, the son of Samuel & Hannah Ashton, of 49 Derby St, Beeston, Notts. From the 1901 census we learn that Samuel, then a foundry moulder, was born about 1872 in New Lenton and his wife Hannah was born in Chesterfield, Derbyshire in about 1875. The family was then living at 3 Maxwell Street, New Lenton; Harry, aged 4 had already started school, his sister Amy was age 2 and they had a boarder living in. Soon after this, they had moved to Beeston where Samuel snr worked at Beeston Boiler Company and at least two more sons and a daughter were born. When Harry left school he was engaged in the lace-making industry, being employed by Messrs. Cookson, Hazzledine & Manderfield. He was a keen member of the 17th (Beeston) Nottingham Company Boys Brigade and a scout member before the formation of the present company. He volunteered in the 11th (Service) Battalion, Rifle Brigade in November 1914. The battalion was formed at Winchester in September 1914 into one of "Lord Kitcheners" new armies which including the reserve units, amassed to over 500 battalions. The battalion was to become part of the 59th Brigade, 20th (Light) Division. After initial training at Hamilton Camp, near Stonehenge, the battalion was posted abroad and landed at Boulogne on 22nd July 1915. Being totally involved in all the battalion’s engagements with the enemy, Harry quickly rose through the ranks and was soon promoted to become a non-commissioned officer, before he was killed in action on 15th August 1917. The area where Lance Sergeant Ashton was killed saw much fighting in the War particular in August 1917, during the "Third Battle of Ypres". On 14th August 1917, the 10th & 11th Battalions Rifle Brigade attacked from either side of the road towards Langemarck. They had to cross the Steenbeek (a stream) running almost north-south, 400metres east of land that is now the cemetery. The 11th Battalion suffered heavy casualties in reaching their objective, a mill, some 200metres further on, but they could not take this heavily fortified position so they withdrew. This action resulted in 1 Officer and 43 men of the 11th Battalion killed on the 14th/15th August. "Harry was sent on an important mission with his platoon in which he lost his life. The work was dangerous but he went about his duty as always. I always appreciated his sterling qualities under a quiet manner and you may well be proud of such a son." 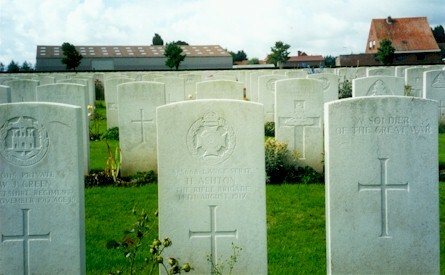 Lance Sergeant Harry Ashton was killed near Langemark, Belgium on Wednesday 15th August 1917 and is buried in Cement House Cemetery. and, on the other side an unnamed soldier - "Known only unto God". Cement House Cemetery was begun in August 1917 and the "Cement House" was given the name by the Army to a fortified farm building "bunker" on the Langermarck-Boezinge road, a little way beyond the stream called Hannebeek. 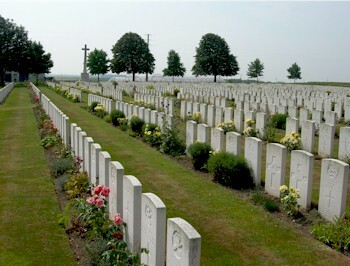 The original burial ground (Plot I, an irregular group of 23 graves) of this large cemetery, and used by the 4th and 17th Division burial officers, by field ambulances and by units in the line until April 1918, while the rest were made after the Armistice with the concentration of graves from the outlying battlefields. Almost 500 French graves in the original Plots XVI, XVII and XVIII were removed in 1922, and the space vacated has been filled in the intervening years by graves brought in from communal cemeteries and churchyards in the area when their maintenance in these locations could no longer be assured. The cemetery is still used for the burial of remains that continue to be discovered in the vicinity, and a number of plots have been extended to accommodate these graves. There are now 3,578 Commonwealth servicemen of the First World War buried or commemorated in the cemetery. 2,411 of the burials are unidentified. Of the 22 Second World War burials in the cemetery, five are unidentified. It is important to remember that this cemetery is still in use. For example, a group of eighteen graves were brought here in the early 1970’s, from a graveyard in Maiseires, near Mons, to make way for a new road. Among them was the grave of Captain Jonathon Edward Knowles of the Middlesex Regiment, who was one of the earliest British officer casualties of the War. 2Q2/1876 - Nottingham Registration District : Ref 7b 303. He was baptised at Lenton Parish Church on 17 June 1896. At that time, the family was living at 1 Albany Place, Lenton. 31901 Census Piece 3164 Folio 164.